One of our guests from 2014, Karen Witter, had such an amazing time rafting with us, she wrote an article about her experience. Karen and her husband, Randy, rafted on one of our most popular trips, the 7-day Motor. Check out her story for tips and lots of insider details! “I was hot, and my skin was damp with sweat. A layer of fine sand covered my feet and ankles. The temperature was over a hundred degrees. I rolled over, attempting to relieve the dull pain in my lower back. Half asleep, my eyes drifted open revealing blurry dots of light above me. I reached for my glasses in the pocket on the side of my cot. Lying on my back, I put them on and gazed upwards into an explosion of brilliant stars filling the night sky. Inadvertently, I began to smile. For several minutes, surrounded by silence, I was transfixed, staring into the Milky Way. I put away my glasses, rolled over, and hoped to drift back to sleep for a few more hours before the sun would rise and with it a flurry of activity at our campsite. It was night one on the bank of the Colorado River in the Grand Canyon. Awesome – on steroids! That is my feeble attempt to describe in words the phenomenal experience of a week-long rafting trip through the Grand Canyon. Exhilarating rapids, rugged hikes, powerful waterfalls, stunning scenery, churning muddy water, crystal blue-green streams, towering geologic formations, majestic California condors, sparkling night skies, oppressive heat, ice cold beer chilled by the river, calming silence, deafening sounds of waterfalls and rapids, extremely fine sand between your toes (and everywhere else), a welcome absence of technology, and not so welcome absence of indoor plumbing are just some of the joys of a Grand Canyon whitewater adventure. I experienced awe standing in Redwall Cavern, knowing I was in the same place that John Wesley Powell stood in 1869 on the first exploration of the Grand Canyon. Powell described the vast cavern as so large he thought it could seat 50,000 people. It was a thrill to see California condors perched on the river’s edge with numbers visible on their breasts, tagged as part of the extraordinary efforts to save this magnificent bird from extinction. During a day hike through a deep side canyon, music echoed through the canyon as someone strummed a guitar playing a familiar tune, ‘… slow down, you move too fast, you got to make the morning last …’ Unexpectedly, and for reasons I couldn’t understand at the time, tears streamed down my cheeks. I believe I truly experienced awesome, a very overused word in the English language. While 4.5 million people visit the Grand Canyon each year, only 27,000 experience the magnificence of the Grand Canyon from the vantage point of the Colorado River. Although not for the faint of heart, it is an experience of a lifetime, and the highly capable and knowledgeable guides provide an incredibly educational, enjoyable, exhilarating, and memorable experience. Our adventure began seven months prior to our July trip when I opened a Christmas gift from my husband, Randy Witter. 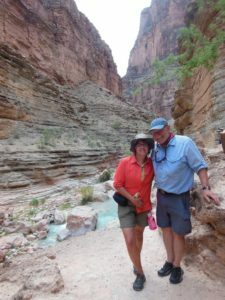 He has a knack for giving gifts that surprise and delight, but I was totally shocked to receive a present for a rafting trip through the Grand Canyon since he enjoys vacations that involve outdoor activities by day and a comfortable hotel by night. Over the next months, I looked forward to the trip with both anticipation and apprehension. It would be a week totally off the grid – no electricity, no cell phone, no shower, no bathroom. We watched the videos on the Grand Canyon Whitewater website, read the FAQs which addressed that most important question of how DO you go to the bathroom, and we dutifully packed everything recommended: quick dry pants and shirts, convertible pants, Keen river shoes, large containers of lotion and sunscreen, a wide brimmed hat, a container of wet wipes, all packed in a duffle bag which could not exceed 25 pounds. There are a variety of options for trips through the Grand Canyon. Randy opted for the one-week motorized rafting trip. The benefits are being able to cover a longer stretch of the river in a week, having lots of time during the day for spectacular hikes and refreshing waterfalls, and taking a helicopter out instead of walking into or out of the canyon. The trip began with an hour-long flight on a small plane from Las Vegas to Marble Canyon airport near our starting point at Lees Ferry where we all assembled to begin our adventure. There were two large rafts, two guides per raft, and 14 passengers per raft. We each received a dry bag with a sleeping bag, sheet, and pillow in which we placed our duffle bag. We also received a small dry bag for use during the day to store cameras, sunscreen, and the day’s necessities. Loaded in the rafts were massive coolers, huge amounts of food, water, cooking equipment, supplies, and all the beer, wine and spirits you provided for yourself. We put on our life jackets, settled onto the raft, received lots of instructions, and headed down the Colorado River, putting our trust in our lead guide, Brock. Although each day was unique as we passed through different geologic formations and segments of the river, there were a number of things that constituted a typical day. Our day began at daybreak, as the sun awakened everyone. Although tents were provided, it was far too hot to sleep in a tent, so we slept outside on cots. We used our tents primarily to change clothes. The crew got up early and began preparing a delicious hot breakfast of eggs, pancakes, potatoes. Some people arose as the smell of coffee wafted through our campsite or when the crew shouted ‘coffee!’ Others assembled before breakfast for yoga. Some wanted to be first to the ‘groover.’ The groover was routinely positioned with a great view, the entrance marked with a T, and you picked up a cushion to carry with you to make it clear the toilet was in use. There was a bucket with a foot-pump for water to wash your hands. The rule was all liquids go in the river; solids go in the groover and are packed out. Using the groover took a bit of getting used to. Although a toilet could be requested at other times during the day if necessary, forcing oneself to regularity was very beneficial. It is far too dry to allow any type of liquid on the ground, as this would have a deleterious impact. Breakfast was served, and then everyone helped break camp and load the tents, chairs, dry sacks, and equipment onto the rafts in an assembly line procedure. Beer, soda, and water bottles were put into gunny-sack bags that dragged behind the raft in the river, which was the perfect refrigerator. Each day on the river was a different experience as the river varied a lot from calm waters to rapids that drenched everyone on the raft from front to back. The front seats took the biggest pounding while the seats toward the rear received less water when going through the rapids. People took turns sitting in the front or back, depending on whether they wanted more or less excitement and how hot or cold they were. The most anticipated rapids, Lava Falls, came on the next-to-last day of the trip. We stopped along the river to hike, play in the waterfalls, explore canyons, or relax. Although the hikes were strenuous, there were alternative options, such as simply sitting in the natural pool at the base of a waterfall instead of climbing to a higher lookout point. We ate our lunches on the bank of the river, prepared by our crew. All of the guides were extremely knowledgeable, and throughout the day they provided vast amounts of information about the geology, biology, history, stories, and legends of the early explorers. Although we occasionally saw another raft or kayakers, for the most part we didn’t see any other people on the river. And, with rare exception (Navajo bridges and the Bright Angel Trail from Phantom Ranch), there was no evidence of development – no power lines, no structures, no cell towers, no technology, no flights overhead as the canyon is a flight-free air zone, thanks to an act of Congress in 1988. Ironically, however, the river is totally controlled by man, with the water that flows through the canyon regulated by the Glen Canyon Dam at Lake Powell. The dam has controlled the flow of the Colorado River since 1963, taming the rapids significantly from the time of John Wesley Powell’s expedition in 1869. One could detect the evidence of human influence as the water level of the river would fall and rise between evening and morning as a result of controlled releases from Glen Canyon Dam. This was especially evident at one campsite where a sandbar became visible in the morning that was submerged the night before. Late in the afternoon, the crew scouted for a sandy area between the sheer rocks where we camped for the night. Another assembly line was formed to expeditiously unload the tents, chairs, duffle bags, cooking equipment, and other supplies. Everyone fanned out to choose a spot for the cots and tent, while the crew magically produced a block of ice for cocktail hour in case you needed some ice in your gin and tonic. The groover was positioned in a secluded place with a nice view. People put up chairs at the river’s edge. Resting your feet in 50-degree water while the air temperature is well over 100 degrees is the best way to cool off. The crew started preparing the evening meal, which was always delicious. Meals featured salmon, steak, pork chops, lasagna, and even a cake for dessert. Everyone cleaned their own dishes (metal utensils and plastic plates). The procedure involved scraping off any loose food and then dipping the dishes into a series of three buckets of water to clean, rinse, and sanitize. This procedure was practiced before and after each hot meal. We enjoyed social time until the sun went down, when most everyone was ready to sleep after the strenuousness of the day. It became easier as the nights went by to fall asleep on a cot in the heat under the stars, with bats silently circling overhead. • Getting on the raft at Lees Ferry and meeting fellow adventurers, who all turned out to be enjoyable and fascinating people. • Hiking up to the Puebloan granaries at Nankoweap, used for storing food in AD 1100, and seeing breathtaking views of the river below. • Standing under thundering waterfalls that could knock you off your feet. • Seeing the rock carving made by the 1923 USGS expedition. • Wearing a life-jacket like a diaper and floating feet first through current of the chocolate-colored, muddy Little Colorado River where it flows into the Colorado River. • Putting my head under the one and only spigot with clean water at the trail leading down from Phantom Ranch. • Soaking up the beauty of the turquoise colored waters of Havasu Creek. • Bouncing over Lava Falls and other rapids and getting drenched by cold water under the expert maneuvering of the amazing river guides. • Being immersed in the grandeur of the Grand Canyon. • Watching helicopters land on a tiny spot 187 miles downriver from Lees Ferry and then flying out of the canyon with spectacular views on the way to Bar 10 Ranch. • Enjoying a hot shower and using flush toilets at Bar 10 Ranch, before taking a flight back to civilization and the glitz of Las Vegas. Although seeing the Grand Canyon from the rim, surrounded by throngs of other people, is still awe-inspiring, experiencing the canyon from the Colorado River is truly awesome. I hope we will resist the temptation to further develop our national parks to make them more like theme parks, and instead encourage visitors to go a little bit out of their comfort zone and experience the true awesomeness of nature. Karen and her husband Randy at Havasu Creek.